Despite enjoying huge success in Europe, especially in Sweden, France and Germany (where sales of robotic mowers account for 6% of total mower sales), robotic lawnmowers have largely spent their early years skulking about on the periphery of popular garden maintenance products in UK. Maybe it was due to the English stubbornness of handing what was once a much-loved pastime over to a machine or refusing to admit that we have far less leisure time than we used to (or that the time we do have could be better spent than wrangling a wilful mower in the heat of summer). But all that is beginning to change. 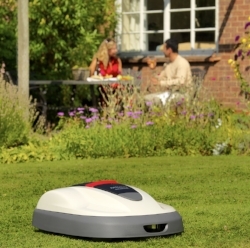 The popularity of robotic lawnmowers is now soaring, and robotic lawnmowers are becoming a regular feature of the UK press. Recent features in the Mirror, the Express, the Telegraph and Sky prove that while the UK might have been a bit slow on the uptake of these garden game changers, we are quickly catching up with our friends across the channel. So why the sudden interest in what was, until recently, the best kept secret among lawn lovers across the UK? With the recent high temperatures people have less energy to get out and keep their lawn trim and want to spend their precious non-working hours relaxing, keeping cool and catching up with friends and family. The garden has become more of a place to relax, everyone wants a gorgeous garden without the hard graft that they would usually associate with it. John Lewis have reported that their sales of robotic lawnmowers are up by 75% this year, and we can report a drastic increase in our sales too (plus we not only supply, but also install the mower for you). There are a huge range of robotic mowers available, thatâ€™s why we recommend that you speak to an expert who will be able to advise you on the kind of mower which would be best suited to your garden, and specialist installation to ensure that your mower will have the desired effect. We offer a free consultation in which we can assess your garden and discuss your options, and a full installation service to give you peace of mind that your mower will provide dedicated and effective service for years to come. New Husqvarna Models for 2018!